Happy new year everyone, I hope it’s a good one for you! I had a little fun in my photo studio yesterday, using one of my Christmas pressies (the desk, which you can’t see much of here, but will feature more in the future), and some of the props I amassed with great intentions last year before I fell into the black hole that subsumed the rest of the year. You can use it on anything you wish, just right click and save as (or whatever the Mac equivalent is), but it’s sized as a screensaver in widescreen format. I thought I’d do a little round up for you of ways you can plan your new year from a sewing point of view. 2. If you like the idea of some challenges in smaller bites, consider A Year Of Lovely Finishes monthly link up with Melissa from Sew Bittersweet Designs and Shanna from Fibre Of All Sorts. For this challenge you don’t have to have a completed project at the end of the month, but to have finished whatever you challenged yourself to do at the start, such as finish piecing a top, or quilting a languishing WIP. There are prizes each month too! 4. Or perhaps you’d like some sewing motivation to get you past your ‘get healthy’ goal with #sweatnsew on IG, run by Becky @sarcasticquilter where there’s a random draw for a sewing prize each month for the participants. There’s no snazzy logo for this that I could locate easily, so just imagine, okay? And now I’m going to confess… I won’t be doing a single one of the first 3, and I’m not really promising anything on #4 either, because this year I’m getting off the hamster wheel both work and creativity-wise, especially creativity-wise. This year at the day job I pledge to work my contracted hours and no more, to take my lunch hours for an actual hour, and in fact leave my desk for them too, and that I will say ‘No’ much more often. I will try and look after myself though, I have a diet and exercise plan to try and combat the 4 stone I put on in the last 2 years at the day job. Yes, I realise how insane that is to have done that, stress eating and a lack of time to cook is not a happy combo! So I might #sweatnsew if the photos won’t put people off their dinner. Creativity wise, I’m not going to hamstring myself with promises. I have issues that mean that if I sign up for finishing things I will feel incredibly guilty if I don’t finish at least one of them. I have realised that I don’t need the extra stress of deadlines whereby the world will not end if I don’t meet them, and there is no-one trying to pay me, or swap something with me. I will continue to create patterns for Quilt Now and occasionally Love Sewing, and I have signed up for a couple of swaps with the idea that all of these will push me creatively. I’ve been reading some books on creativity in the last few weeks, and I’ve decided it’s time to play. I have started by taking swatches of all my bag making fabrics and popping them in a notebook. Yes, I did have to take a few deep breaths before cutting into some of them, but I reasoned that a square inch or two would not kill me, and there is no pattern I have ever written that has used every single piece of fabric in a metre cut or more! So happy new year to all, I hope you have a great 2015 and achieve all you creatively desire. Love that photo with your props! Thanks for rounding up this list. your goal for 2015 is a tough one and I would be happy to see you at swatnsew as I find it motivating to see us working out and not looking like barbie 😉 and we feel amazing after even if we still don't look like her! saying no is a challenge and not easy so I wish you all the best! Sounds like you have a healthier plan for the new year for both body and mind. I hope it is fun to loosen the ties and leg go of what you don't have to do. love how focused you are with your resolutions. Good luck in the new year, may it be filled with the most amazing experiences and people. It's good to focus on what serves you and let the rest go (as my yoga teacher often said), especially for the fun stuff in your day. Well done my love, and if there's anything I can do to help, then let me know. 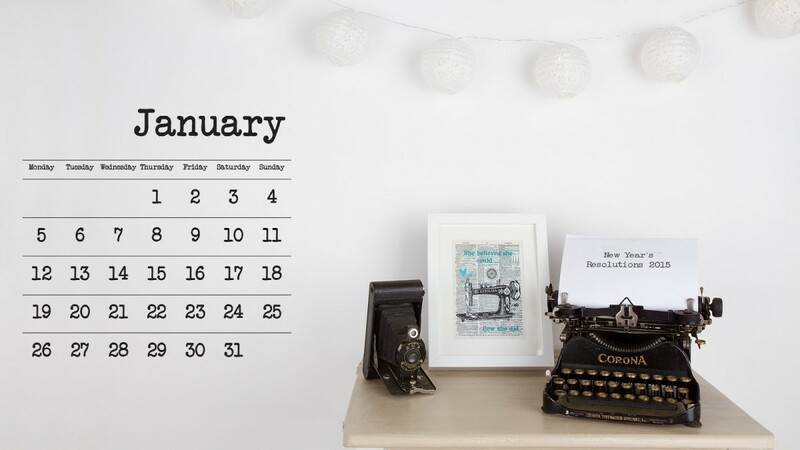 I love your January photo, that type writer is the coolest! You're starting the year off with an excellent plan Katy. It'll be good for you to let go a little and make more time for You!! Have fun playing with your creative board. I want my "word of the year" to be NO! for 2015, too!! No to extra volunteer things, no to unnecessary purchases, no to eating out more than once a week, no to my kids when it's necessary, no to guilt! 😊. Happy New Year, friend! I'm with you on all of that!!!! I offer to be your motivation buddy, low stress, no-deadline, cookie avoidin', creative mojo spikin girl! One among many, I'm sure 🙂 Too many pressure deadlines and obligations that funked creativity this past year, so on to a healthier, more fun New Year! Woo!! Excellent goals – especially taking it easy, looking after yourself and NOT going in all. the. things. This will be the year Katy gets her groove back! Enjoy, my dear, and all the best for this sparkly New Year. I wish you much success in your goal! I love it. Happy New Year, Katy – I love your plans for 2015. Wishing you a Happy and Healthy 2015 Katy, I shall enjoy watching your progress in nurturing that creative gene. Sounds like a great idea – wishing you a gentle, successful year. It sounds like you have a solid plan in place. This is going to be my "do" year. I always have elaborate goals and ideas but something always prevents me from doing. Not this year! Can't wait to see what you come up with! And thank you for the shout out too! I adore your plan of taking care of you this year. No guilt is the way to go. Just like creativity happen as it should. I'm having days like this when I don't want to do anything at all but my moods are changing quite quickly so good luck!